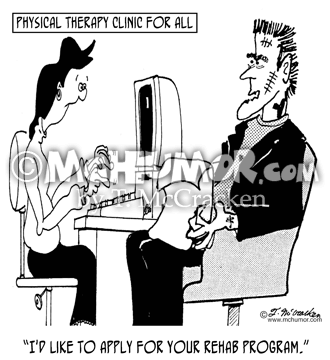 Disabled Cartoon 7375: Frankenstein's monster at a physical therapy clinic saying, "I'd like to apply for your rehab program." 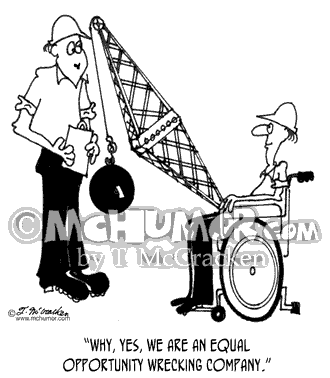 Disabled Cartoon 3504: A foreman saying to a man in a wheelchair equipped with a wrecking ball, "Why, yes, we are an equal opportunity wrecking company." 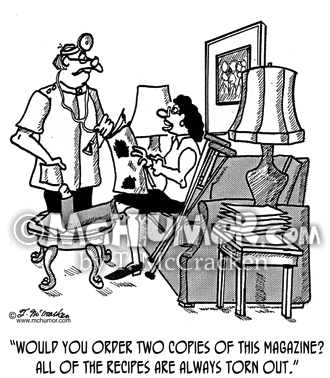 Art Cartoon 1975: "The Venus de Milo with a new prosthesis." 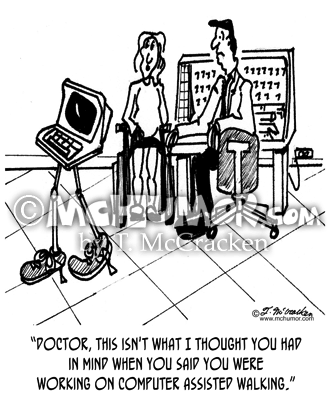 Vandals have put an artificial arm on the statue. 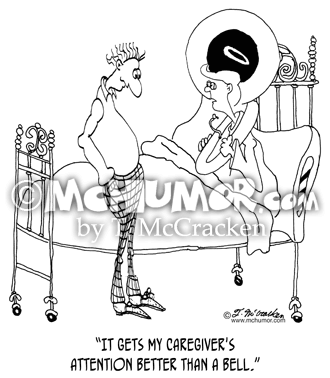 Caregiver Cartoon 7376: Someone in a hospital bed with a tuba explains, "It gets my caregiver's attention better than a bell." 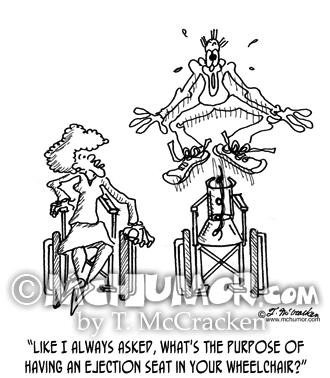 Wheelchair Cartoon 1381: Woman to man being catapulted out of wheelchair, "Like I always asked, what's the purpose of having an ejection seat in your wheelchair?" 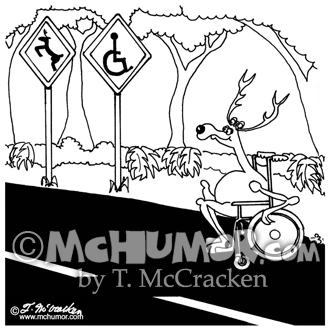 Disabled Cartoon 5355: A deer crosses the road in a wheel chair where there's both a deer crossing and a handicap sign. 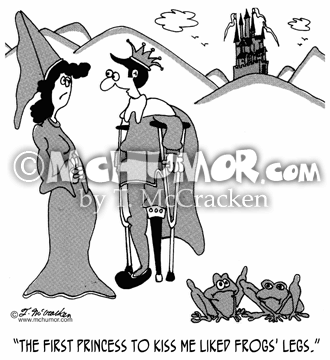 Hippy Cartoon 8821: "Nobody warned Marge that a side effect of a hip replacement is feeling more hippy." 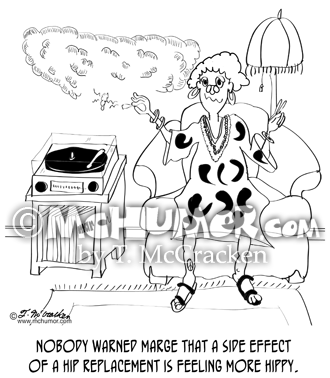 An elderly woman dressed like a hippy smokes pot and listens to a stereo. 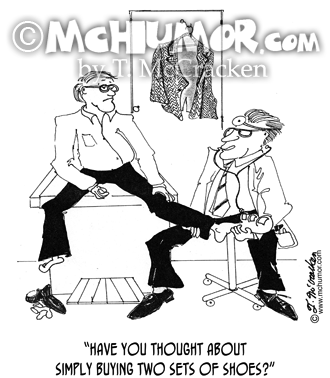 Shoe Cartoon 9042: A doctor examining a man with one HUGE foot asks, "Have you thought about simply buying two sets of shoes?"